Louis XIV is the only dancer, among the many nobles and professionals who appeared in the ballets de cour, to repeatedly attract the attention of scholars. His rank and the extent of his repertoire make any appraisal of his dancing career a challenge. The King performed some 68 roles in 24 ballets de cour, together with at least one role in a comédie-ballet, from 1651 to 1669, a period of nearly twenty years. I list all these roles below. I will limit myself to just a few observations about them. There is more work to be done on Louis XIV premier danseur, but as much (if not more) research is needed on his dancing contemporaries if we are to reach a proper understanding of his involvement in the ballet de cour. The King took some roles more than once. He danced the role of le Soleil (the Sun) three times: le Soleil levant, Ballet de la Nuit (1653); le Soleil, Ballet d’Hercule Amoureux (1662); le Soleil, Ballet de Flore (1669). 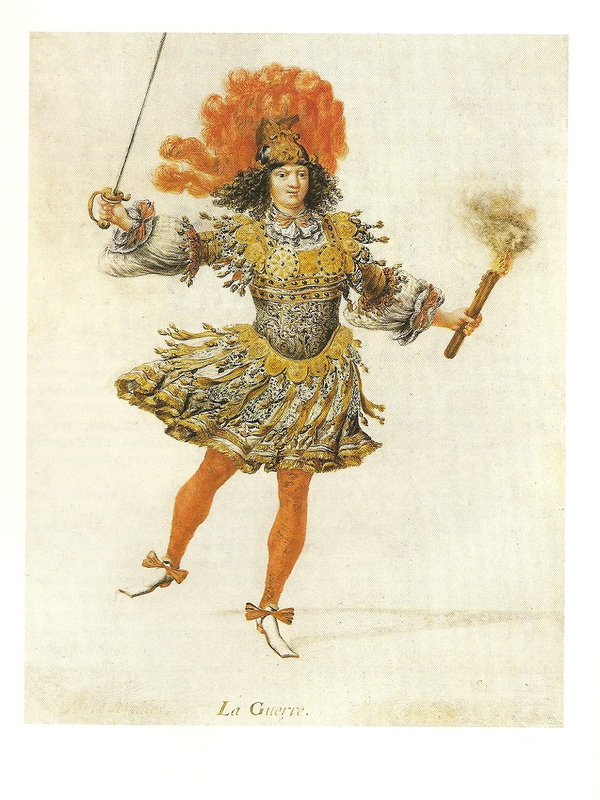 Despite the frequent identification of the Sun with Apollo, Louis XIV danced the latter role only once, in Les Nopces de Pélée et de Thétis (1654). He appeared as a Maure in three ballets, as Printemps (Spring) in three and as a Berger (Shepherd) in three. These few roles give us an idea of his range as a dancer. His first such appearance was at the age of thirteen and the last took place when Louis was twenty-eight. Louis XIV began to dance in public when he was thirteen and ceased when he was thirty-one. Over the period of his dancing career, he not only danced alongside his own courtiers but he also appeared with the leading professional dancers of the time. Louis XIV as La Guerre in Les Nopces de Pélée et de Thétis (1654). Workshop of Henry de Gissey. Louis XIV did not appear in the Ballet des Plaisirs Troublés (1657), Ballet de Xerxes (1660), Le Triomphe de Bacchus (1666). He danced as an Egyptien in the III entrée of the comédie-ballet Le Mariage Forcé (1664). He probably did not dance the roles in the first and last entrées (Intermède 1. I: Neptune. Intermède 6. V: Apollon) intended for him in the comédie-ballet Les Amants Magnifiques (1670). This entry was posted in Ballet de Cour, Dancers & Dancing Masters, Dancing at Court and tagged Ballet de Cour, Baroque Dance, Louis XIV on February 19, 2015 by moiragoff.